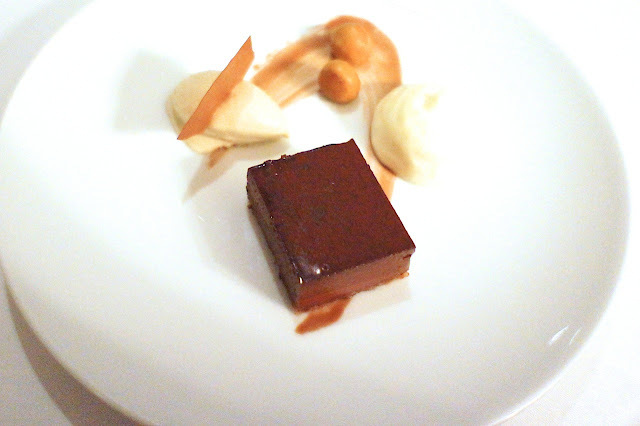 Update: Shane Osborn, the Australian chef of Pied a Terre during this meal, has left the restaurant to go traveling and the kitchen has been taken over by his one-time protege, Marcus Eaves, who was previously head chef at Pied a Terre's sister restaurant, L'Autre Pied. 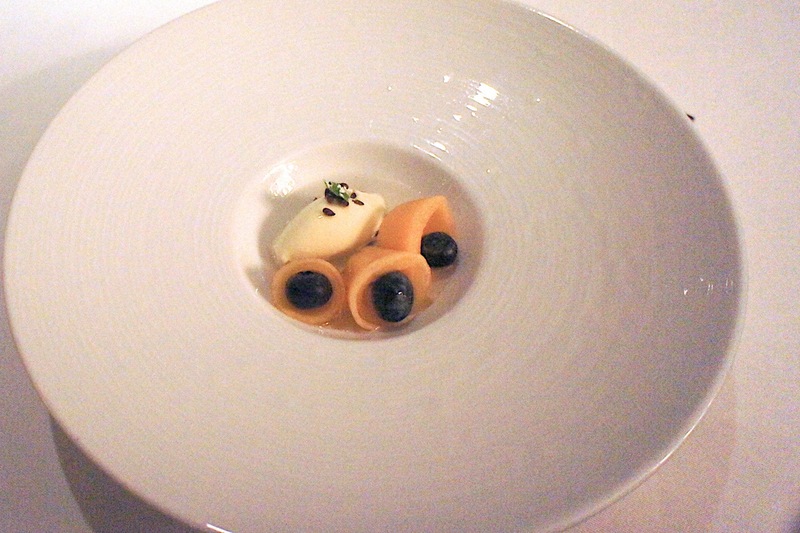 Pied a Terre is a 2-Michelin star modern european restaurant in London. It has a rather non-descript facade and is located along Charlotte Street (quite a busy street with various eateries and bars), near the Goodge Street London Tube station. The first time we ate here was about a year ago, and we were very impressed by the quality of the food at this joint. 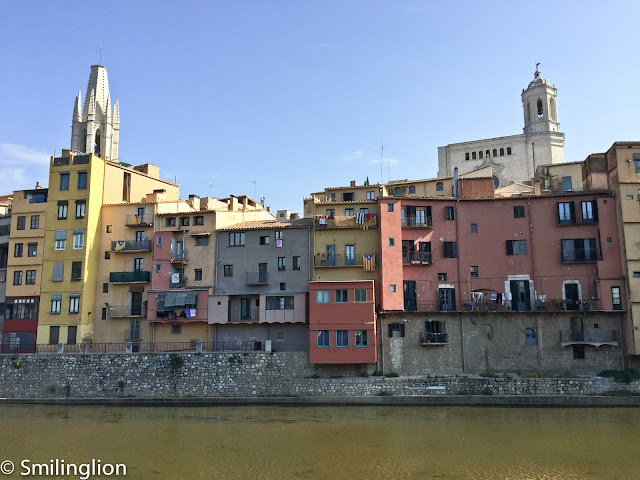 This time, we were rather apprehensive that our very high expectations may not be met, as we had just returned to London after four consecutive nights of fine dining in Paris. We were a table of four this time, and they seated us in the main dining area at a corner booth (which was private but rather dark - the restaurant was darker than I last remembered it, perhaps because now I am focused on taking photos and the lighting wasn't conducive for it). This is quite a small restaurant (or at least it feels like it) with a seating area at the front (with a window view of the street) for smaller groups and with the larger tables at the main dining area at the back. I suspect they may have tables upstairs for private events but did not manage to check it out. The one grouse I had with this restaurant was that it's wine list was quite limited in its old world wine selection, although it made up for it somewhat with a broader selection of new world wines (wines from Australia, New Zealand, Chile etc were well represented). In the end I opted for the Daniel Mortet Gevrey Chambertin (I think it was the 1999), which was drinking very well. 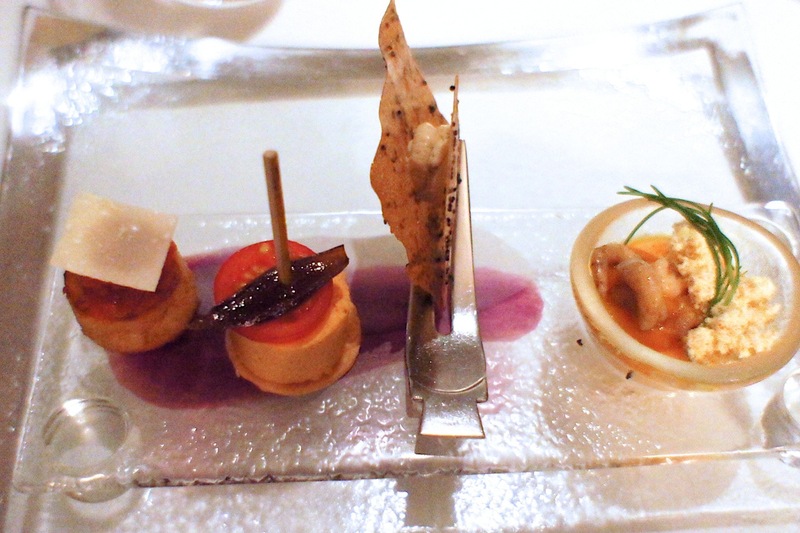 We all opted for the tasting menu, and were started off with a glass of champagne each and some amuse bouche, which was very light and quite tasty. Service here was quite gruff though, with the exception of the sommelier who would engage us in some banter. 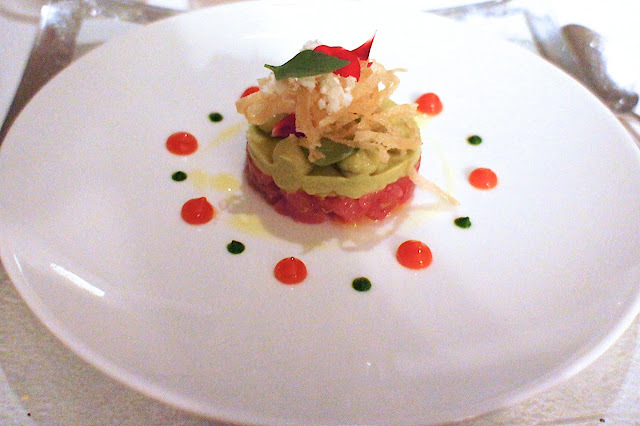 The meal proper commenced with a yellow fin tuna tartare, avocado puree, thai basil, coeur de boeuf tomato ketchup and lemon oil powder. This was very delicious, with the avocado giving structure to the light and juicy tuna tartare. Presentation was very good too, and it was clear that this chef was one who regarded his plate as his canvas, though not at the cost of his food tasting good as well. Next was the marinated scallops with a salad of golden and purple cauliflower, fresh wakami, argan oil and wasabi creme fraiche dressing. From its name, it's clear where the chef got his inspiration from. 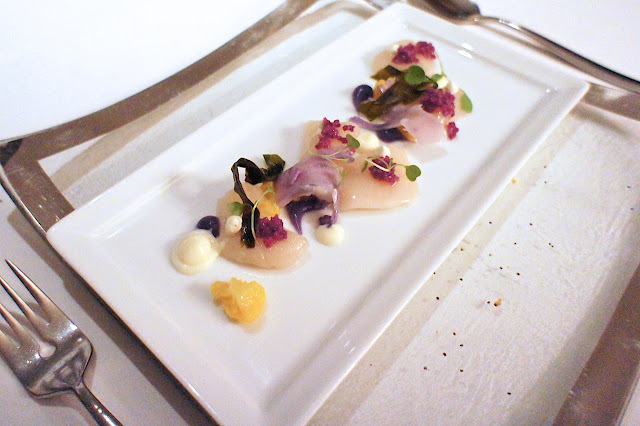 The raw scallops were very fresh, and each petal (despite looking pretty) added to the flavour of the dish. This dish reminded us of how Kaiseki meals in Japan are like; where flowers are used to decorate the plate yet contribute significantly to the taste of the food. This was followed by the poached foie gras in a sauternes consomme, charred red onions, borlotti beans and smoked bacon. This didn't look like much but was an excellent dish. We hadn't eaten foie gras in soup before, so this was a first; in fact, the sauternes consomme was a very good complement to the liver. 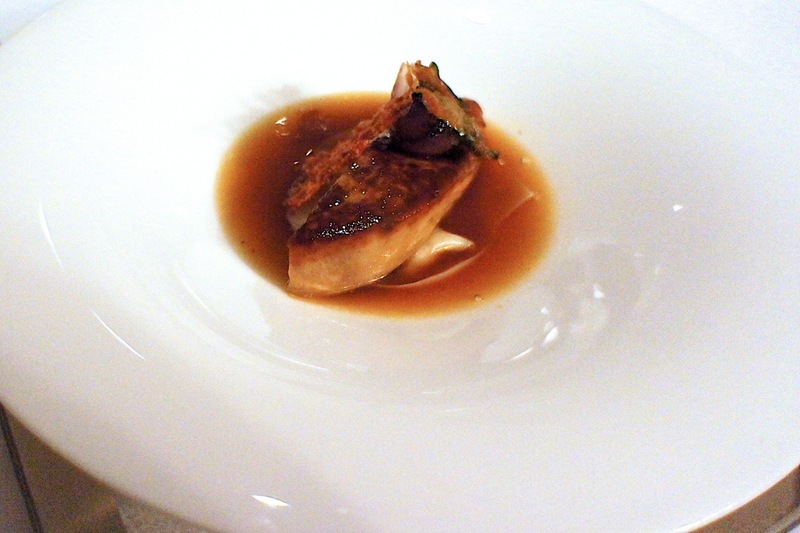 Usually a port, sherry or brandy is reduced for the sauce (which can typically overpower the foie gras), but in this case, the much lighter sweet wine was skillfully employed to bring out the flavours of the foie gras instead. Then on to the main course; the pan-fried john dory, squid tagliatelle, fennel salad, mandarin and cardamon gel and fennel pollen. I'm not a big fan of john dory, and the fish itself did not blow me away. 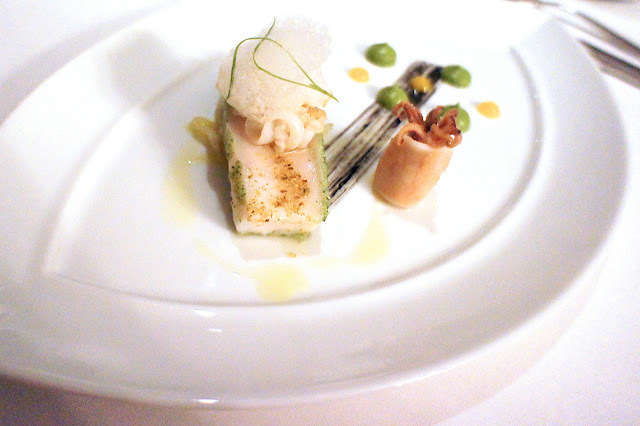 The squid was nicely cooked though, and the overall presentation of the dish was very pleasant. 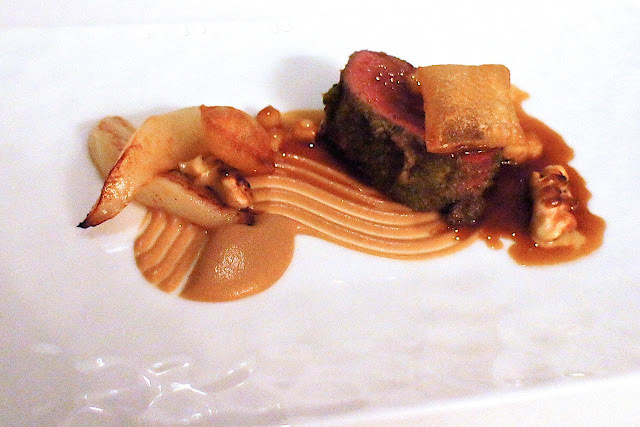 Next was the herb crusted saddle of Sika venison with roasted celeriac puree, fresh walnuts, caramelised pears and red wine sauce. This was a very good dish, with the pears going quite nicely with the juicy and tender venison. After a rather unremarkable cheese selection of some comte and blue cheese, we moved on to dessert. First we had the salad of Charentais melon and blueberries, Liquor de Sapin ice cream and toasted linseeds, followed by bittersweet chocolate tart, stout ice cream and macadamia nut cream. The stout ice cream was appropriately bitter and very interesting, while the macadamia nuts were crunchy and a good end to a very good meal. 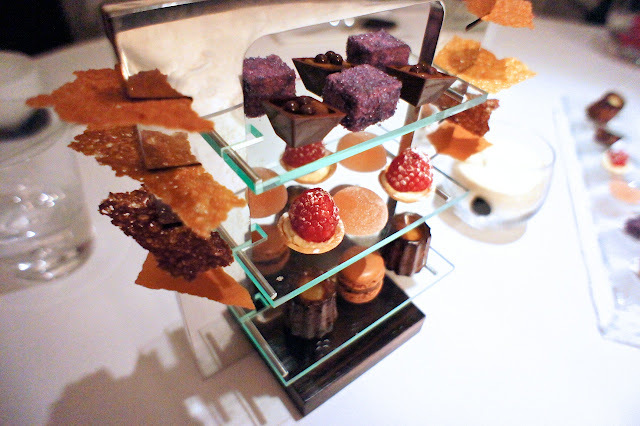 A healthy selection of petit fours and coffee/tea completed the dinner. We were surprised that we could still enjoy dinner despite eating way too much the previous four nights in Paris. This was a testament to the light touch and good use of fresh ingredients by the chef, who did not overdo any particular dish and always made you wanting more. On the other hand, this is probably the kind of restaurant where some people come out of still feeling a little hungry. Final Thoughts: Very good food without attempting to be too cutting-edge; as close as it comes to being described by us as a fine-dining 'comfort food' place. Chef Osborn cooks well without over-complicating his dishes. The wine list was slightly disappointing for being pretty limited for a restaurant of its standing, although it carries labels from across the world and has less emphasis on Old World wines. The dining area is quite small and intimate, though we felt the tables could be better lit during dinner. With the exception of the sommelier, who was very friendly and helpful throughout, the rest of the service staff were professional but came across as quite brusque.